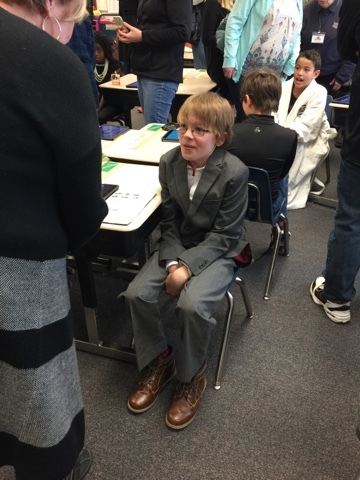 As part of a school project to study historical figures and learn public speaking, the fourth grade at the kids’ school curated their own Wax Museum. The students chose their icon, researched and prepared a brief biography about him or her, then set up a “booth” complete with full costume. I was completely impressed with not only the kids’ attention to detail, but also how poised and articulate they were. There were quite a few parents gathered, and if the kids were nervous about the crowd, they did a good job to overcome it. 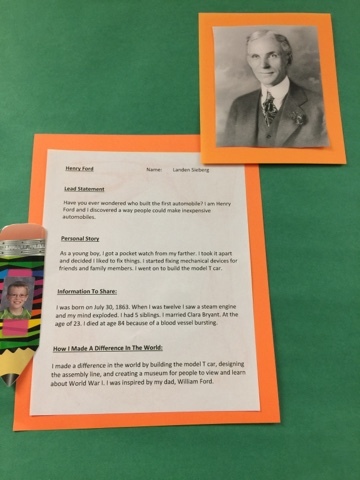 Landen chose Henry Ford - creator of the Model T, the efficient production assembly line, and the 5-day work week.